One quart is equivalent to one gallon of our competitors dyes to treat the same amount of water!. 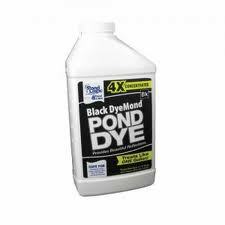 Black DyeMond is formulated to give your pond a long lasting natural blue color. One quart of our super concentrate will treat one surface acre of water 4' to 6' deep. with the color black. It is formulated to impart an attractive black coloring to natural and man-made ponds, water hazards, lakes and fountains. It reduces sunlight penetration, therefore reducing the growth of ugly algae. It is important to never let the black fade for this will give weeds and algae a chance to become established making them difficult to control. In colder climates Black DyeMond should be added just before winter to stop sunlight from penetrating the ice. Black DyeMond will give your pond a rich appearance and provide beautiful reflections. For an even more Mystic looking pond, use a 50/50 mix of Nature's Blue and Black DyeMond! Safe for people, pets, fish, waterfowl, & wildlife. Water temperature and degree of agitation will influence dissolution and dispersion of the Black Dye. Can be used at all water temperatures. Filters out the sunlight to control weed growth. Irrigation, swimming and other recreational uses are approved during and following the use of this product. Applications to chlorinated water may require more frequent treatment. No water use restrictions and is safe for humans, fish and other wildlife.